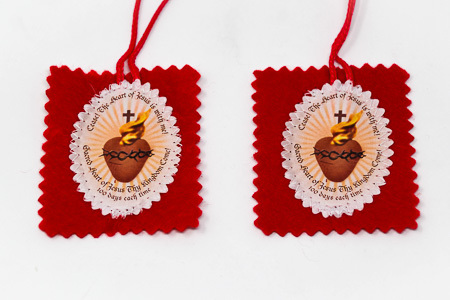 Red felt scapular with the image of the sacred heart with cross, fire and thorns. "Cease! The Heart of Jesus is with men! Sacred Heart of Jesus Thy Kingdom Come!" Measures approximately size: 2" x 1 1/2".